In this blog I will share information about my Art projects and describe the process of making them. I also share hints how I solved some of the practical problems I have faced while working with different gadgets. 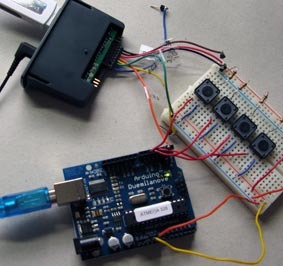 23.5.2009 I got first sound out of Mp3 player that was controlled by arduino. I used VMUSIC2 module, which can play mp3 files from USB memory stick. I needed to update the firmware in order to make it working with all available commands (for example volume control). After updating the firmware, the VMUSIC2 started behaving like the manual described. After reading the manual more carefully, I noticed that the MPEG3 chip was actually a product of VLSI solutions - A Finnish company located about 300 meters from my working place at the same campus. Eventually, I did not use VMUSIC2 because all USB sticks I found were too big to fit properly to the robot chassis I was building. Instead I used MP3 Trigger with microSD card. I am a visual artist and a designer. I have also Msc degree in telecommunication and video signal processing. I consider contemporary technology as material that can create multidimensional and layered meanings especially when combined with other concrete materials. Note that all material in this blog is copyrighted. You may not publish, modify, transmit or in any way commercially exploit any of the copyrighted material placed on this blog without my permission. @2010 Outi Aho. Travel theme. Powered by Blogger.